Buy through MusicWeb for £12 postage paid. It must be noted that these are different recordings from those available CDs previously on the Lotos label, LT0085-2-131, LT0112-2-131 and LT0052-2-131. Having signed an arrangement with Nimbus, inaugurating the Nimbus Alliance, their recordings of the late Beethoven Quartets have already appeared under that new imprint (NI6100). Patrick Waller found that earlier release something of a mixed blessing, but thought that 'it should be well worth investigating this modestly priced set' - see review. It's clear from the recording dates that these early quartets were performed in tandem with the late quartets - one of each per concert, presumably. It's not surprising, therefore, that my reactions are similar to PW's, namely that these are good performances which I have been pleased to hear, but they wouldn't be my first choice. Even the Op.18 quartets were regarded in their day as unconventional. Much as Beethoven refused to acknowledge what he had learned from Haydn, perversely maintaining that he had learned more from Salieri, his symphonies and quartets show repeated signs of his trying to outdo Haydn's later works in these genres and the Op.18 quartets are no exception. They are 'early' only in the sense that the other quartets came later; Beethoven had already found his voice in the Op.9 String Trios. Very well played as these Wihan Quartet performances are, I just miss the last degree of that out-Haydning of Haydn, as, for example, where a moment of great stillness is followed by a loud exclamation of the sort that Haydn made something of a trade-mark. The best-known examples are in the Surprise Symphony, immediately after the slow introduction, and The Creation, on the word es werde Licht, let there be light. 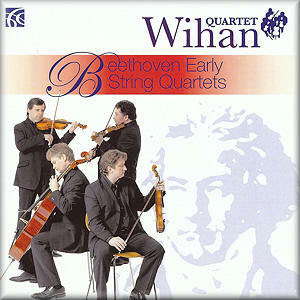 When Beethoven plays the same card, the Wihan Quartet take the edge off it a little. From these Wihan performances the young Beethoven emerges as a very gifted and rather polite composer. The first epithet is certainly justified, the latter not really. Listen to the very opening of the first quartet from the Wihans and then from the Takács Quartet and you'll hear the difference; the Decca performance (470 8482) makes the connection between Op.18 and the middle-period works much more apparent. This is even more the case in the slow movements of this and several of the other quartets. Michael Cookson, reviewing Op.18/5 on a super-budget compilation of Takács recordings available only from Buywell, though preferring the Quartetto Italiano, put his finger on the qualities which the Takács bring to this music when he wrote '[they] are thoroughly at home here and play as a single voice' - see review. Tempi are part of the difference between the Wihan and Takács performances, though not, of course, the whole story. In Op.18/1 the Takács are very slightly faster throughout and this makes their performance just that little more urgent, especially in the finale. The same is true of most of the rest of the set; when the Takács give themselves a little more space, as in the slow movement of Op.18/2, their 6:30 against the Wihan 5:54 gives their andante just that little extra room to sound truly cantabile. Conversely, in the slow movement of Op.18/3, their tempo, six seconds faster, allows them to emphasise the second part of the direction andante con moto. Taken on its own, the Wihan Quartet performance of Op.18/6 is very impressive, with powerful playing in the finale. The opening section of this finale, entitled la Malinconia, depicts melancholy before the mood in the main body of the movement changes to one of joy. The depiction of a mood or state of mind in music was not new - Jan Dismas Zelenka had composed a whole suite depicting hypochondria and Haydn had explored a number of moods in his Sturm und Drang symphonies, but Beethoven's manner here anticipates many aspects of his later quartets, with joyful and mellifluous passages interrupted in mid flight by ominous chords before being allowed to resume. The Wihans cope well with the drama of this movement until one compares them with the Takács performance. In the latter hands the movement opens almost inaudibly and at a slower tempo, as if wisps of thought are curling around in the atmosphere before settling into an altogether firmer sense of thoughts that lie to deep for tears - certainly too deep to be put into words. When the first strands of joyfulness creep in, they, too, begin tentatively before being allowed full rein. Paradoxically, though they take longer than the Wihan Quartet (8:20 against 7:39) their version of this movement actually sounds shorter. Though these are live performances, the audience remains incredibly quiet. I'm not sure whether the applause at the end of each work sounds polite rather than enthusiastic because the audience shared some of my reservations or because they were so incredibly well behaved. On first impression the recording is very clear. It sounds fine on the beefier of my systems, but a little thin on the other. I hear the first violin a little too clearly, the cellist slightly less prominently, and the inner parts get a little lost - but that's a common problem with string quartet recordings and I don't want to make too much of it. The Decca recording for the Takács Quartet is much more truthful in presenting all the parts without making the first violin too prominent. The notes in the Nimbus booklet are extremely detailed and informative. The significance of Haydn's last completed quartets, Op.77, and Beethoven's first set, Op.18, being dedicated to the same Prince Lobkowitz had passed me by before reading Misha Donat's notes. I noted just one typo: the track listing gives the opening of the finale of Op.18/6 as La Malincolia, correctly given as La Malinconia (melancholy) in the notes. I've been making recommendations for the middle and late quartets in recent Download Roundups, but haven't yet got round to the Op.18 set. This new set from the Wihan Quartet enters a strongly competitive market in which, for example, even such good performances as those of the New Budapest Quartet (Hyperion CDA66401-3) are not among the front runners and are now available only from the Archive service. Similarly, though these Wihan Quartet performances would shine in a less competitive field, there are better versions to be had. The Italian Quartet recordings seem not to be available at present, so I think it has to be the Takács recording, on a 2-CD set for around £20 or available for download for £15.99 from passionato.com in very acceptable 320kbps mp3 sound. I haven't heard the Tokyo Quartet versions but I very much liked their middle quartets; they are also economically presented on 2 CDs (Harmonia Mundi HMU90 7436.37), or available to download in 256kbps sound from Amazon.co.uk; be warned, however, that at least one online dealer has them for just over £12, over £1 less than the cost of the download. For all the virtues of the Borodin Quartet, they run to a less economical three CDs (CHAN10381, downloadable from theclassicalshop.net - see Paul Shoemaker's review of the whole Borodin series). NB: I was in error when I reported that the Quartetto Italiano set of the Beethoven Quartets was no longer available. The separate set of the Early Quartets does seem to have disappeared from general availability but our partners at Arkivmusic.com have the complete Quartetto Italiano set of all Beethovens Quartets for $77.99, though they report that stock is low. Our other partners at Crotchet.co.uk and Amazon.co.uk also have the complete set for £56.72 and £55.79 respectively.